China and the USA have repeatedly traded barbs in the past over what Washington says is Beijing's militarisation of the South China Sea by building military installations on artificial islands and reefs. The archipelago lies off the coasts of the Philippines, Malaysia, and southern Vietnam. China claims almost all of the South China Sea, though Taiwan, the Philippines, Brunei, Malaysia and Vietnam all claim parts of it. 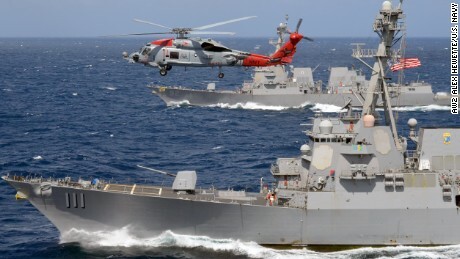 The deployment is seen as the latest attempt by Washington to stand up to what it believes are attempts by Beijing to limit freedom of navigation in the strategic waters, where Chinese, Japanese and other Southeast Asian navies operate. The US labelled the Chinese warship's actions unsafe and unprofessional, while Beijing said the US was threatening the safety and sovereignty of China. The news comes on the day that a US trade delegation arrived in Beijing for another round of talks in the ongoing trade conflict between USA and China.